· Evaluates electrical system, products, components and applications by designing and conducting research program. · Appling knowledge of electricity and materials. · Conform system and components, capabilities by designing testing methods, testing proprieties. · Perform all the duties of an electrical engineer. 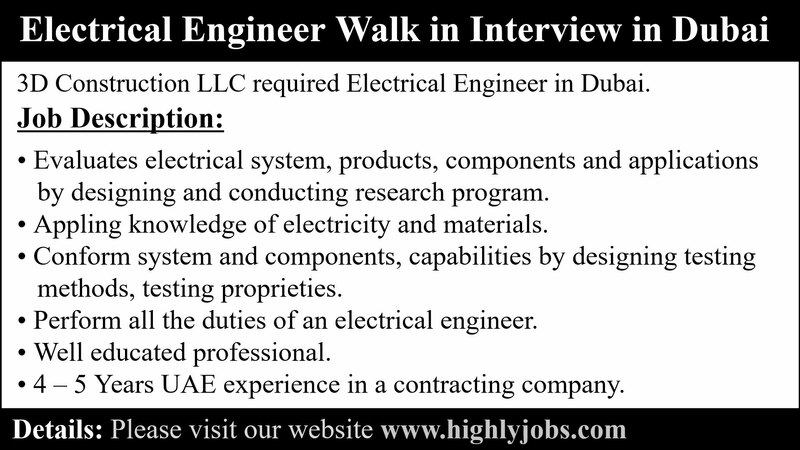 · 4 – 5 Years UAE experience in a contracting company. If you not meet the above-mentioned criteria will not be interviewed. Walk in Interview for immediate hiring. Date: 29th September 2018 To Onward. Address: Office #918, Business Village, Block B, near DCC Metro Station.